Another packed day in Tanzania! We were off to an early start with another amazing breakfast from Pina (today complete with Tanzanian donuts!) and quickly out the door for a full day with Make A Difference’s driver, Paul and one of Make A Difference’s children, Peter as our guides. First stop: the Royal School to drop off the more than 500 donated books! We got a quick glimpse of the campus before we were off. With only time for a short water break, we headed back to the car to travel to our next destination for lunch––a beautiful hotel tucked away amongst the trees near Mt. Kilimanjaro. We had a lovely ‘al fresco’ lunch, complete with equally lovely company. Our digestion had to be short, because not soon after it was time to make our way across the road to the next spot on our tour: a museum all about the local Chagga tribe. In a matter of 30 minutes, we learned all about traditional Chagga huts and tools. Before European settlers arrived in the area, Chagga people lived to be more than 130 years old! We were also lucky to have Paul with us, whose grandfather lived in a traditional Chagga hut when Paul was a boy! Once our 30 minutes were up, it was time to get on the road again––this time, back to the Royal School to help organize and shelve the books we donated earlier in the day. We met the headmistress of the school, Mrs. Ndjeke, who showed us around her school and graciously thanked us for all of our support to the school. After exchanging a multitude of ‘asantes’ (‘thank you’), we hopped back into the car to head back towards Moshi town. Moshi town was a bustling metropolis compared to the small villages we had been in throughout the day, and we stopped to exchange money and buy ingredients at the local market for our upcoming Italian dinner, courtesy of our resident Italian amici. Once we had bags filled with fresh produce from the local market and our pockets filled with Tanzanian schillings, we finally headed back towards the guest house for dinner––but not before a quick pitstop at the ‘duka’ (‘store’) across the street with Paul. The day rounded out with another incredible Pina meal, complete with barbecue and guacamole! After such a jam-packed day, it’s safe to say we’ll all sleep well tonight! We’re relaxing now after wrapping a busy day of volunteering. Seven of us in total––one from Canada, two from the US, and four from Italy––bringing our skills and experience to Tanzania. We started our day with a full breakfast of eggs, toast, and fruit salad (watermelon, mango, passion fruit . . .) which was necessary to keep us powered for the day. After breakfast, Theresa, Janeth, and Revo gave us an overview of the organization, its founding, stats and infographics, and what to expect for the week. We asked lots of questions and learned as much as we could about the area, the schools, and the programs. From orientation, we moved into another full meal, going very traditional Tanzanian. Ugali. A polenta-like maize mixture that you eat with your hands used as the vehicle for a relish of cooked spinach and spices. We relied on a demonstration from Upendo and Joseph to ensure we were eating it right––one handed. Pina rounded out the meal for us with some cucumber, carrot, and red onion salad on the side. Suffice it to say, we’re eating well. With full bellies, we went for a walk through the village. The weather has been rainy, so we put on tennis shoes and rain coats, but stayed dry the whole time. The walk was beautiful, interesting, fascinating. We all loved it as our first foray into the African outdoors. We passed many people on the street coming and going, and shared a ‘Jambo’ and ‘Mambo’ (‘Hi’ and ‘What’s Up?’, respectively). The highlight was when we walked through the market and a group of kids came running out from a stall waving and shouting ‘hello’. On our return, we entered a house full of students in the organization. We went through a ‘conga line’ of students giving the double hug greeting. We jumped into an ice breaker with the students, each sharing the one place we’d travel to if we could go anywhere in the world. The most popular choice from the students? India. After a coffee break, each of us shared our career journeys with the students. The main themes we shared with them: make studying fun, be the best you can be, follow your passion, learn as much as you can, and don’t be afraid to try something new. We turned it back to the students, and they shared their career dreams with us. Lots of future doctors, a couple civil engineers, some entrepreneurs. Our takeaway from them: they have better thought-out aspirations then we did when we were their age, and they have huge hearts. For most, the inspiration for their occupation comes from their desire to help their families and communities. We ended our time with the students in smaller breakout groups so we could all get to know each other better. After the students left to return to their villages, we jumped into helping out in other ways. We labeled and numbered 500+ book donations, and then we organized and inventoried all of the donations we brought between the 7 of us. I was honestly blown away by what we all brought from so far. Piles and piles of clothes, 30+ pairs of shoes, and lots of school supplies, all inventoried to give to the kids as they need it and for special holidays. And then yes, more food. Lemongrass chicken, rice, spicy peas and tomatoes, and a fresh vegetable salad. Pina treats us well with plenty of food for everyone. We’re wrapping up our night sitting around talking about tech, making jokes about consulting, and playing the card game of ‘one’ — or as the Italians call it ‘uno’. 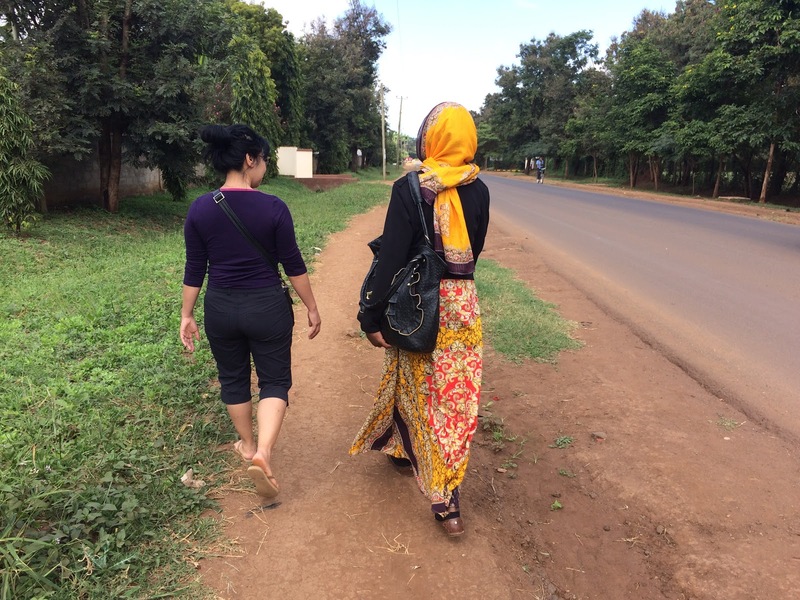 My first impressions of Tanzania — a vibrant culture full of color, friendly faces, kind greetings, sites, sounds (loving the sound of Swahili), and tastes. She is from Australia and this is her second time volunteering with Make A Difference. Naomi is known for her unbelievably fast speech and ability to accomplish tasks. She is a do-er. The eldest of four in her family. Naomi is well versed in programming and accounting. She registered with AfID (Accounting for International Development) and got connected with Theresa from MAD. Both of her trips to Tanzania have been six weeks long. During the first trip she climbed Mt. Kilimanjaro and went on a safari. In the time it takes one person to sit and think about doing something, Naomi has already done it. She used her hands to express the rate at which Naomi accomplishes tasks, “I can see you at your house and nobody can sit down because you tell them they must do a task,” she said with laugher. During her first trip, Naomi also helped with the Kilimanjaro Kitchen cookbook. All of the proceeds from the Kilimanjaro Kitchen cookbook goes towards providing quality education for vulnerable children. When I first arrived at the MAD guesthouse, I was nervous about traveling around the area. The location is gated and there is a security guard. It led me to believe that the streets around are not safe and I should not go walking far. Naomi’s view was quite the opposite. “My view is that fear attracts fear, so I do my best to feel peaceful and trust,” Naomi said. From here she is traveling to Hong Kong to visit family. Naomi is very family oriented and places great emphasis on helping others. Naomi is a traveler and seeker of new experiences. She highly recommends volunteering with MAD to all interested. Jump in and help out where you can, the Naomi way! For many years, climbing Mt Kilimanjaro was on my bucket list. I don’t remember when it made it onto the list or what prompted me to add it. I just remember thinking that it was the only continental peak that one could hike to, as compared to a mountain like Everest which is a technical climb, needing special skills, training, and a lot of money! As such, I felt it was a big adventure I could add to my bucket list and manage to check it off one day. When I decided it was time to check it off and I started doing research for the trip, I looked to find a book that would help me plan and prepare for the trip. The book I found was “Kilimanjaro: The Trekking Guide to Africa’s Highest Mountain” by Henry Stedman. I first discovered it through a web search and stumbled on the author’s website. It had a link to Amazon to purchase the book, and a variety of information about the climb. On the front page of the website, I noticed a link named “Charity Climbs”. While climbing Kilimanjaro as part of a charity climb was not on my radar, curiosity got the best of me, and I clicked on that link. The rest, as they say, is history! It is a history that has had me travel to 3 continents, including twice to Africa, and has connected my wife Olga and I to 22 children in the Kili region (now 24). When I opened the page listing the charity climbs, first on the list was Make A Difference (MAD). There were other charity climbs on the list, some of which had more familiar charities associated with them, but there was one unique thing about MAD that “made the difference”: it included spending a few days volunteering with the people your fundraising would be directly benefiting! While I had participated in walks/hike/etc. for the typical charity causes going all the way back to my teens, this was the first time I had come across a scenario like this where I would get to witness firsthand the effects of the money I would raise. So doing this was an easy decision for me. Convincing my wife to participate would take a bit more work, as her bucket list did not include a Kili climb! But I still knew there was a way that would make a trip to Tanzania an easy decision for her too. We had talked about the possibility of a volunteer trip in the past, and the opportunity hadn’t come up yet. I thought that she might be interested in spending more time volunteering with the children while I climbed Kilimanjaro, and my thoughts proved to be correct. We decided to reach out to friends to see if anyone would be interested in joining us, either to climb with me or to spend time volunteering with Olga, and we were both able to find people interested in both. I found a friend interested in the climb (and she brought along a friend of hers), and Olga found a friend interested in volunteering with the children. So my original interest in the MAD climb got 5 people to travel to Tanzania (and fundraise for MAD!). The actual experience was even better than we expected! We both got more than we hoped for and the connection with the children was instantaneous! It would also turn out to be a long-term connection. My wife and I decided to sponsor one of the children supported by MAD; her name is Upendo, which means Love in Swahili! 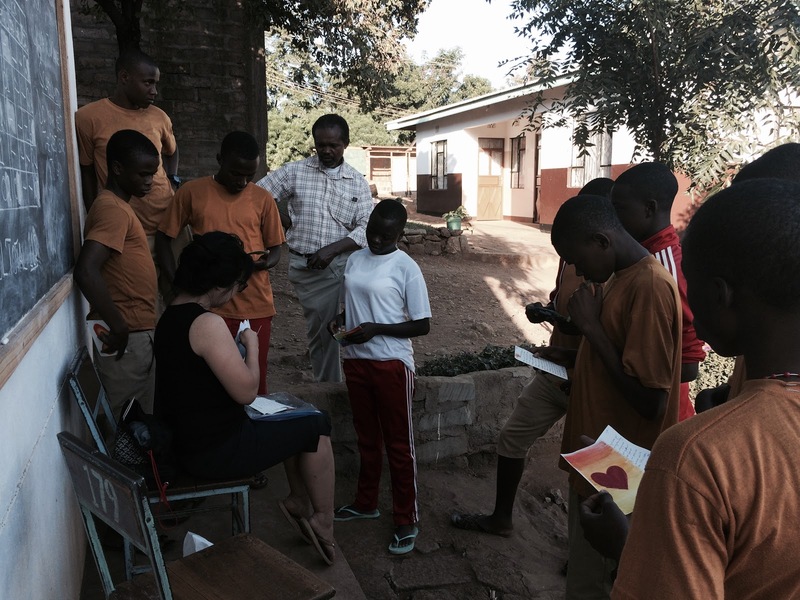 I am writing this blog entry during our 2nd trip to Africa to spend time with the children. This time both of us are volunteering with MAD for 8 days. Between that first trip to Tanzania to climb Kilimanjaro in 2013 and this 2nd trip to volunteer in 2017, I have done 2 other treks/climbs with MAD. I participated on the first MAD Patagonia trek in 2015, and the first MAD trek to Mt Everest Base camp last year (good thing for MAD that I have a long bucket list!). Since I came one day short of reaching that goal in 2016, I will be leading the 2nd trek to Mt Everest Base camp for MAD in 2018 (see below for flyer)! I am hopeful we will be able to get a large group of people to participate that will help raise even more money for MAD! The end result of that one fateful click in October of 2012 has resulted in the 2 of us directly or indirectly helping raise somewhere in the vicinity of 15-20 thousand dollars for those children. And if that money wasn’t enough, it has created a connection for us that will likely last for many years to come!